The G14 group of Europe's most powerful clubs has disbanded after Fifa and Uefa agreed to listen to them on key issues. Arsenal, Liverpool, Manchester United and Rangers were among the 18 clubs at odds with the bodies over compensation for players injured on national duty. Some clubs had taken legal action but that will be dropped after the parties agreed to work more closely together. Uefa and Fifa say they will compensate clubs for players taking part in European Championships and World Cups. 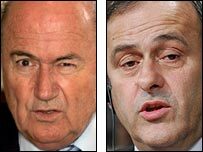 Fifa president Sepp Blatter said: "The clubs, which are the basic cells of our game and fundamental to its thriving, are at last to become a part of the pyramidal football organisation." Uefa president Michel Platini added: "The demands of the clubs to be heard and to be associated, also financially, are well-founded. The letter of intent is not a political step, but a logical one." G14 will be replaced by the European Club Association, which will have more than 100 members, including one from each of Europe's 53 national associations. "Significantly, the clubs are going to get paid when their players take part in international tournaments," said BBC sports news reporter James Munro. "All the details have not yet been sorted out but I understand that it is going to be a daily rate irrespective of whether it is £100,000-a-week or £1,000-a-week. "The fact is the with the dissolving of the G14 all of their legal actions against Uefa are going to go as well as the threat of a European super league, which I think was a big concern. "The clubs will now say they are also going to get more of a say in the running of the game."